"This stuffing recipe has been in my family for decades. How can you go wrong with bacon? Whether it be baked in muffins tins or right inside the turkey, this is sure to be a hit!" Place bacon in a large skillet and cook over medium-high heat until cooked through but still slightly soft, 5 to 10 minutes. Drain the bacon slices on paper towels, retaining bacon drippings in the skillet. Melt butter in a separate skillet over medium-high heat; saute onion and celery until softened, about 5 minutes. Stir bacon and poultry seasoning into onion mixture. Mix onion-bacon mixture and bread pieces together in a large bowl; fold in eggs. Spoon bread mixture into muffin cups. Bake in the preheated oven until tops are crispy, about 25 minutes. 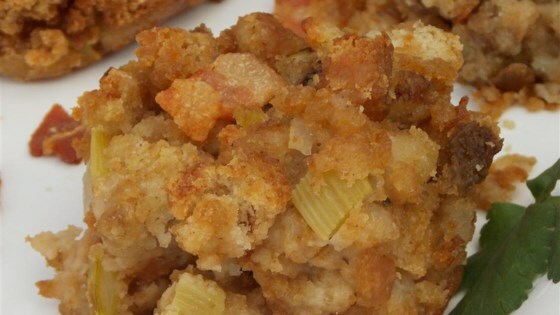 See how to make this delicious all-purpose stuffing or dressing. This recipe can be lightened up by using turkey bacon, chicken stock, and whole wheat bread. But if you are making it for Thanksgiving, I say just go for it! If you think the stuffing is too dry after adding the eggs, you can add bacon drippings (or milk or chicken stock) until you get the right consistency. It was a little dry. I added additional broth, which helped. Not sure if I'm going to make it again. Used stove top stuffing with bacon and made in muffin tins. Made ahead and warmed up just before serving. Taste was great! The muffins had 1 good bite each. The rest was dry. I added the bacon drippings after the eggs. It was my first attempt at any stuffing. Two loaves made way too much bread, all the rest was great, definently used the turkey drippings for moisture.